Deb's Cup of Tea: Time to get creative. 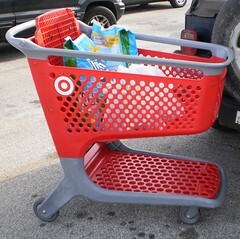 When did Target replace their metal carts with these big plastic ones and are these made from recycled products? I ask because I wandered over to Target on Saturday. I have a budget and I've become fairly good at sticking to it. The list included a trip to Michael's craft store, Target, Dominicks and Ace Hardware. I got Michael's done. Target was done and that came in more than I anticipated so there was no trip to Dominicks for groceries or to the hardware store for a new leaf rake. The Target trip was very productive. I'm back on decent allergy medication and that makes a world of difference in how I feel and how I sleep. I have to consistently remember to take it and not think, "Oh I didn't cough as much. I don't need it." LIES! I'll never get ahead of the allergy curve if I don't take the stuff daily. That shiny bottle of cough syrup doesn't need to be opened if I take the pill at night like I'm supposed to. There was a new shower curtain to purchase and window insulator plastic. The cats needed fresh litter. It all adds up. When I got home, I realized I had just enough money to get gas to drive to Davenport and back on Tuesday for a job. That is cutting it tight, but that's life, for me. It does mean I have to get creative with the food I have in the cupboard over the Thanksgiving holiday ahead. 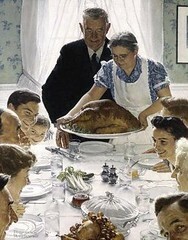 We have the Rockwellian image of the family clustered around the table which groans with food. That's not everyone's reality. For some, a soup kitchen's food line is all the hot meal they will get. For others, Thanksgiving is a peanut butter sandwich consumed on their 30 minute lunch break. Remember, a lot of people work holidays and weekends just because it's their job. For some, Thanksgiving is a time to be with friends or family, laughing, joking, watching TV, just being. For others, it's a time to endure bad jokes and snide remarks and wish they could be anywhere but with these people called "family". And, for some, like me, it's a time to just be. Everything I got at Target, with the exception of those awful crackers, was an item off a previous list. It was important to purchase these things now and not push them off again. That it's required my Thanksgiving to a bit of an exercise in creativity is not the issue. I have pork chops to cook. I can make pork chops with orange rice. I can make a variety of chicken dishes. I can't make the Golden Stuffed Iowa Chops or the "Apple Cider Glazed Chicken with Maple Pecan Rice". I don't have shredded cheddar nor do I have apple cider. What I do have is a balanced checkbook, a non-overdrawn account, two cats who love me, a warm home, a working car and a job. Many people don't have any of this. That I have $3.16 in the checkbook is not an issue. I am happy. There is always the wish that I could have a bit more so I maybe could get cheddar, cereal, bread, apple cider, pasta and frozen veggies, but I am happy and that's what counts.